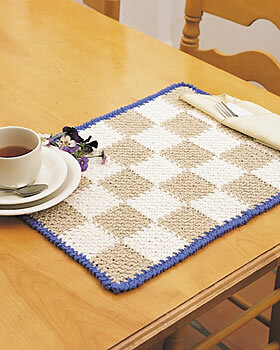 Use your favorite colors and this free pattern from Bernat Yarns to crochet a contrasting checkerboard placemat. These placemats are the perfect way to add a quick and easy burst of color and your own style to your kitchen. Approx 14 x 18 1/2" [35.5 x 47 cm]. Bernat Handicrafter Cotton (Solids: 50 g/1.75 oz) or (Ombres: 42.5 g/1.5 oz) or yarn of your choice. Main Color (MC): 5 balls. Size 4.5 mm (U.S. 7) crochet hook or size needed to obtain gauge. 20 sts and 15 1/2 rows = 4" [10 cm] in pat. Note: Wind small balls of the colors to be used, one for each area of color in the design. Start new colors at appropriate points. To change color, draw new color through last 2 loops of previous color as indicated. 1st row: (RS). 1 sc in 2nd ch from hook. *(Ch 1. Miss next ch. 1 sc in next ch) 4 times. Ch 1. Miss next ch. ** 1 sc in next ch. With A, 1 sc in next ch. (Ch 1. Miss next ch. 1 sc in next ch) 4 times. Ch 1. Miss next ch. 1 sc in next ch. With MC, 1 sc in next ch. * Rep from * to * twice more, then from * to ** once. With MC, 1 sc in last sc. Ch 1. Turn. 2nd row: *With MC, 1 sc in next sc. (1 sc in next ch 1 sp. Ch 1. Miss next sc) 4 times. 1 sc in next ch 1 sp. ** 1 sc in next sc. With A, 1 sc in next sc. (1 sc in next ch 1 sp. Ch 1. Miss next sc) 4 times. 1 sc in next ch 1 sp. 1 sc in next sc. Rep from * to * twice more, then from * to ** once. With MC, 1 sc in last sc. Ch 1. Turn. 3rd row: *With MC, 1 sc in next sc. (Ch 1. Miss next sc. 1 sc in next ch 1 sp) 4 times. Ch 1. Miss next sc. ** 1 sc in next sc. With A, 1 sc in next sc. (Ch 1. Miss next sc. 1 sc in next ch 1 sp) 4 times. Ch 1. Miss next sc. 1 sc in next sc. * Rep from * to * twice more, then from * to ** once. With MC, 1 sc in last sc. Ch 1. Turn. 4th to 12th rows: Rep 2nd and 3rd rows 4 times more, then 2nd row once. Ch 1. Turn. 13th row: *With A, 1 sc in next sc. (Ch 1. Miss next sc. 1 sc in next ch 1 sp) 4 times. Ch 1. Miss next sc. ** 1 sc in next sc. With MC, 1 sc in next sc. (Ch 1. Miss next sc. 1 sc in next ch 1 sp) 4 times. Ch 1. Miss next sc. 1 sc in next sc. Rep from * to * once more, then from * to ** once. With A, 1 sc in last sc. Ch 1. Turn. 14th row: *With A, 1 sc in next sc. (1 sc in next ch 1 sp. Ch 1. Miss next sc) 4 times. 1 sc in next ch 1 sp. ** 1 sc in next sc. With MC, 1 sc in next sc. (1 sc in next ch 1 sp. Ch 1. Miss next sc) 4 times. 1 sc in next ch 1 sp. 1 sc in next sc. Rep from * to * once more, then from * to ** once. With A, 1 sc in last sc. Ch 1. Turn. 15th to 24th rows: Rep 13th and 14th rows 5 times more, ending with join MC, ch 1. Turn. 25th row: As 3rd row. Rows 2 to 25 form pat. Cont in pat until work from beg measures approx 14 ins [35.5 cm] ending with a 12th row of pat omitting turning ch at end of last row. Fasten off. With RS of work facing, join B with ss to lower right corner of Place Mat. 1st rnd: Work 1 sc in each sp along each side of Place Mat, working 3 sc in corners. Join with ss to first st.
Next rnd: Working from left to right, instead of from right to left as usual, work 1 sc in each sc around. Join with ss to first sc. Fasten off.